The Japanese Barberry is in a class of deciduous shrubs with thorns that can tolerate a little punishment from the environment or poor soil. 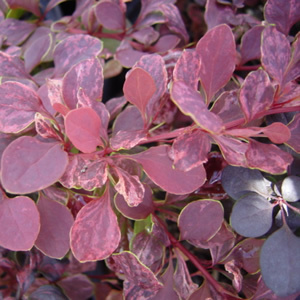 Berberis thunbergii ‘Rose Glow’ is a shrub with graceful growth and dense foliage. Its leaves are a marbled bronzy red and pinkish white then deepening into a rose and bronze color. In the winter this shrub has bright red berries. Rose Glow Japanese Barberry grows to be 5 feet in height and 4 foot in width.